Influencer marketing software seems to be taking the internet by storm. But, what exactly does it do and who is an influencer? 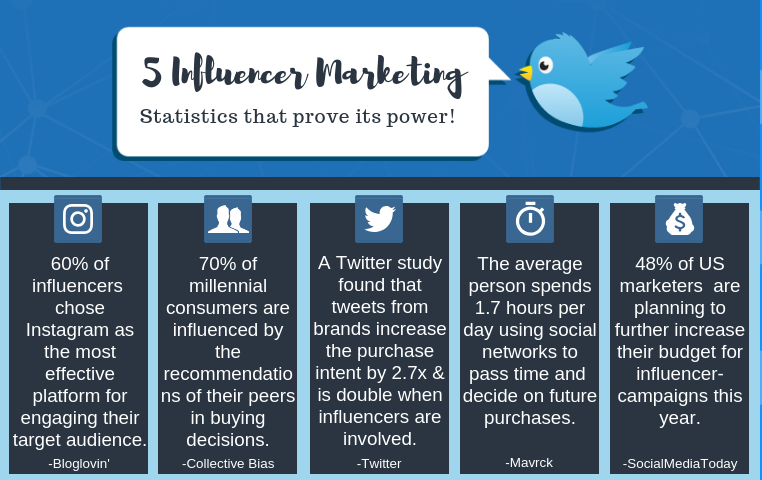 Another common term heard in the marketing world is influencer. But what is influencer marketing software and how is it different from other types of marketing software? What Is An Influencer Program? Influencer marketing uses influential people to spread the word about a business. They become promoters and advocates of the brand. What Is the purpose of influencer marketing? Most common influencer programs rely on public speakers, celebrities, bloggers, social media gurus, and vloggers. These individuals cast out their branded content to as many people as they can. This serves as an advertisement for a brand. It is different from referral marketing. Referral marketing is an individual sharing a brand to the people they actually know. The gist of an influencer program is that influencers create content and share it with their entire outreach. They may review, try, or wear a product and display that experience to their following (similar to how a brand ambassador vouches for a specific product). The terms depend on what the brand is wanting to achieve. Most of the time, an influencer program will contain a checklist of actions the influencer is to do. For example, a makeup brand may want influencers to create a Snapchat video using the product. Then they may request the influencer to upload an image of them with that product to their Instagram. They may also want the Instagram post to include a certain phrase or hashtag. On top of all that, they may want the influencer to write a review of the product. Influencer programs incentivize the influencer to share by giving them freebies. Some programs take it up a notch and provide cash and/or other incentives for sharing. Certain brands consider the number of followers an influencer has as a way of determining the amount of compensation. If you can imagine, this creates a pretty good marketing campaign. What Does Influencer Marketing Software Do? First, some brands might use different words to describe their platforms, while each brand might have different features and products, it fits into one category: Influencer Marketing. Influencer marketing software provides a platform for influencers and brands to meet. A brand signs up for a profile and sets filters for their target influencers. Campaigns then become available to matching influencers who are on the platform. But how does a brand know if an influencer is a good fit? An influencer submits their profile to the brand campaign. Campaigns will only become available to an influencer with matching demographics and interests. The software allows brands to track and manage influencer requirements, as well as analytics for the campaign. Some influencer software provides users with a checklist to finish. While others allow brands to assign single tasks at a time. To note, that usually means this one task has to be complete before the influencer can move on. 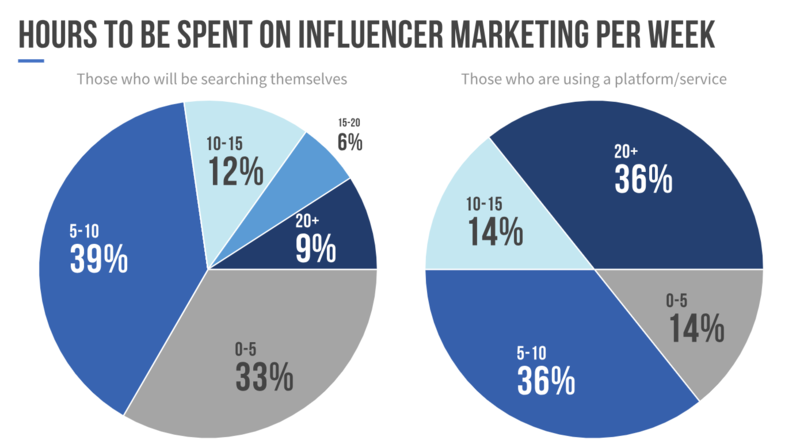 Influencer marketing software also weeds out poor performing influencers. This way brands always have a reliable list of influencers to choose from. For example, influencers who miss campaign requirements can become blocked from the platform. Or become blocked from future campaigns with that brand. Some platforms may even charge the influencer the price of the product(s). Content marketing is still king. However the second runner up is influencer marketing. The increase of marketing budget has fueled the growth of influencer marketing software. That should mean these softwares to should you manage your marketing and time. We noticed that most experts based on our research spend more time using an influencer platform versus those who aren’t. Now you can interpret this in a number of ways. But shouldn’t using a software save you more time? The way we see it is that those who do use software tends to be more proactive, and possible produce more successful influencer marketing. Bumble and bumble ran an influencer campaign through Influenster. There were specific tasks users had to complete after receiving the product. Each task came with its own specific set of instructions. For example: when reviewing the product online influencers had to state that the product was given to them for review purposes. Then, when posting about the product on social media, the influencer had to use certain hashtags in their posts. They also had to mention the product was a complementary product. Instagram shows 490 posts using that specific hashtag! Let’s introduce the influencer software and dive into each one a bit more. Here you’ll get a brief overview of the company and see some of their top features that can help make your influencer program a success. TapInfluence was founded in 2009 as a community for bloggers. Great content creation is the epitome of their evolution and quickly led TapInfluence to become the world’s first Influencer-Generated Content Engine. The platform brings together content creators, influencers, and brands. These relationships lead to actions and meaningful content. 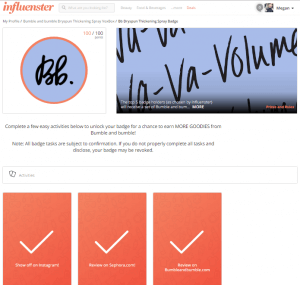 Influencers can sign up through the Tapinfluence platform and are matched with brands. Brands invite the influencers who are matched with them. Some influencers make influencing a full-time gig and create content for brands regularly. The best part is influencers can sign up for free. Influencer Discovery – The platform helps brands discover over 50,000+ opt-in influencers. Influencer Discovery gives brands a 360-degree view of the influencer so they are able to get their best match. This feature includes audience intelligence, influencer profiles and search, and influencer performance data. Easy Automation – Building and executing influencer marketing programs of any size, or complexity is made easy. Everything from influencer communication with your brand, content creation and content review, content scheduling, and social activation can be automated. Analytics – Track engagement across multiple channels like blogs, Pinterest, Instagram, YouTube, Facebook, and Twitter. Analytics make quantifying engagement, total media value, and ROI easy. Including Actionable analytics, Real-time ROI, and Influencer performance. Upfluence Software is an all-in-one SaaS that allows brands to manage campaigns all the way from the identification process to the payout. 650 brands use Upfluence to run their influencer programs. Upfluence’s solutions are designed to help brands with their content marketing efforts by giving them a way to create a variety of content. By providing brands with a way to share impactful content, brands have an easy way to get more clients. Upfluence helps brands with the entire process of planning, creating, publishing and amplifying content. Identify influencers – Locate your influencers in just a few clicks. The search engine features 20+ advanced filters and a database with over 600K+ profiles (growing every day). Customize your search with criteria such as keywords, follower count, engagement level, geolocation, language, and social platform. Screenshots of the software here. Browse the latest posts – View live analytics for any influencer: with 8.7M+ content updates per day at your fingertips there’s no risk of picking the wrong influencers (but if you wanted to automate this process, their team of experts is at your disposal). Once you’ve found Influencers, you can easily create and export lists with contact information or work directly within the application. Manage the campaign – Helpful templates and mass emailing allows users to contact their influencers directly within the software, manage the responses, and coordinate campaigns. Know when your mail has been opened, negotiate contracts, and easily track influencer posts with their Publisher tool. Last but not least, a payment processing platform integrated into the database simplifies influencer interactions so brands can focus on their marketing goals. Track Success – Upfluence software offers social listening and reporting tools which provide analytics of published content throughout the campaign. Easily accessible reports include CTR, engagement, and shares so success metrics can be measured instantly. Creators tell their product story and share your brand with their audience. Famebit allows millions of people to learn about your brand. Influencers have a way of getting their audience’s trust in products, brands, and services. Getting started is easy. In 4 steps, businesses can start getting user-created content. First, a business creates their campaign. They start to receive proposals, then they select a creator, and finally, they get content. All content gets verified and approved by the brand before it goes live. This way businesses remain in control of their image. Creators can signup and submit to campaigns. When submitting to a campaign, creators disclose the type of content they plan to create. They also discuss their fee and their typical campaign completion date. Flexible budgets – Signing up for FameBit is free. 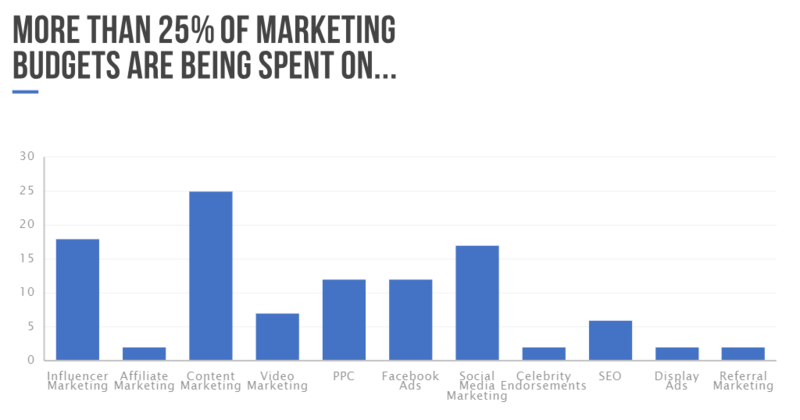 Brands are in charge of how much they spend on content, thus it’s easy to stay within budget. Some brands choose to spend thousands of dollars per campaign. While others choose $100 campaigns. Tools powered by data – Finding the right content creator is essential for any program. Famebit has an advanced filtering system for campaigns. Brands target creators that fit their needs. Brand safe content – Brands can view creator profiles. Review content and proposals. Send brand specific talking points, and decide what content gets posted. “Engagement For Your Brand Anytime, Anywhere” Influenster is the leading influencer marketing platform that helps brands make connections, drive engagement, and create advocates. The Influenster community is huge, with 4MM+ members that help brands gain conversations and valuable user-generated content. A community of social savvy shoppers that stay up to date on the latest products, provide reviews and share their thoughts on tested products. Brands can hyper-target influencers to boost conversation around products and/or services. This is done by sending out VoxBoxes, which are complementary product packages sent to targeted Influensters based on their social media presence and other demographic information. Not only do influencers have to show off these specific products, but they’re also asked to provide reviews and feedback across various platforms. VirtualVox – Whether brands are looking to drive contests, sweepstakes entries, attendance at events, or promote in-store deals (and more), Influenster helps amplify the brand’s conversation and buzz. Consumer Insights – Influenster delivers fast results at a fraction of the cost of traditional market research. User-Generated Content – Content is authentic & original. Influencers interact with brands by creating original content that encourages word-of-mouth marketing. 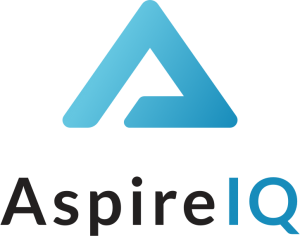 AspireIQ is the leading content generation platform powered by influencers. With over 100 leading brands like Bare Minerals, GrubHub, and Madewell, Revfluence is an enterprise-grade software suite built for social, digital and PR teams to generate branded content at scale via hundreds of thousands of influencers worldwide. AspireIQ analytics leverage millions of data points to provide real-time content feedback, increasing ROI across paid, earned and owned channels. Revfluence automates: responding & negotiating proposals, setting guidelines & reminders, product shipments tracking, content review, tracking posts. Creators, on the other hand, can set their terms and find brands that they want to work with. Creators also get paid quickly – their PayPal accounts receive the payments – right after they share content. Influencer database – There are over 500,000 influencers in the database. To find the right influencers, they have powerful search and filtering options like follower size, follower demographics, hashtag, keyword, age, location, and more. Automatic staging and workflow – Their CRM-like solution makes it easy for a single user to manage hundreds of influencer relationships from outreach to payment. Content Library – Because influencer content outperforms traditional studio shot content, social media managers are now becoming valuable content sources for everything from email marketing to Facebook Ads. The content library gives teams a single source to view and collaborate on this content. Ambassadors sign up and then accept campaigns to take part in that match their profile and likes. Brands select their ambassadors in 3 steps. Pick audience – With in-depth targeting and segmentation capabilities. Select by interests, location, shopping habits, and much more. Choose marketing goal – New and established businesses have 7 different marketing objectives to choose from. Review and analyze – Brands get immediate results, analytics, and real-time campaign optimization. User-Gen Content at Scale – 10,000 hyper-targeted creators to choose from. Authentic Engagement – Average engagement on campaigns is above 7%. Cost-Efficiency – 90% Discount on traditional influencer cost. Whether you’re a small business, medium business, or a large corporation, Assembly is a great fit. It brings all of a brand’s influencer marketing campaigns into one place on one platform for easy management. Their goal is to help brands and agencies create stellar influencer campaigns that drive results. So no matter what the end goal is, building brand awareness, getting more downloads, clicks, etc, Assembly helps brands track and analyze the entire campaign. Campaign Creation – Assembly walks you through the entire campaign creation process. They help you plan out your campaign, decide on goals, outline requirements to influencers, manage deadlines, specify payment type and more! Analytics and Tracking – With Assembly’s proprietary tracking technology you can track, analytics and report on all of the following metrics – Views, Reach, Engagements, Clicks, Conversions, Content Created and ROI. Communication – Important in any relationship! Through the Assembly platform, you can ensure two-way communication between influencers and brands. Linqia combines the science and accountability of online media with award-winning service. Their AI-driven platform and team of experts is leading the transformation of influencer marketing. Their Performance Platform also serves as a social content lab. So marketers can test and amplify the best performing influencer content to drive greater ROI. Founded in 2012, Linqia works with over 250 leading national brands. Linqia’s headquarters are in San Francisco, CA, with offices in New York, Chicago, and Bentonville. With Linqia, marketers can store and manage all their influencer content. Brands can view influencer content and program analytics in real time. Program analytics identify which pieces of content perform best with each audience segment. Therefore, brands can take that content and amplify it on their paid, owned, and earned media channels. AI Delivers ROI at Scale: Linqia Performance Platform’s machine learning technologies from Google and Facebook help drive greater ROI for customers. The platform has analyzed millions of potential influencers in the U.S. and identified 100K that meet the criteria for success. PerformanceMatch™ uses a combination of AI-driven analysis and audience targeting to analyze influencer content and identify patterns that determine which influencers will deliver meaningful results. Target Audiences: Reaching core audience demographics is critical to selecting the right influencers for your brand. Linqia combines proprietary data tracked through the platform with social data from Facebook and Twitter to determine the demographics of influencers’ audiences across multiple platforms. Customers can reach specific demographic and geographic segments across the U.S. to target influencer audiences by age, ethnicity, location, education level, and annual income. Goal-based Pricing: Linqia has run thousands of influencer programs using proprietary algorithms to surface insights and drive repeatable, predictable results. They offer goal-based pricing that aligns with customer objectives, whether that be Reach (CPM), Engagement (CPE), or Traffic and Conversions (CPC). They are confident in their technology, which means they guarantee results. Linqia has a 93% customer repeat rate. IZEA is an influencer marketing platform for agencies and brands that automates influencer campaigns. The platform shortens the process and workflow, on top of providing great features for campaigns. 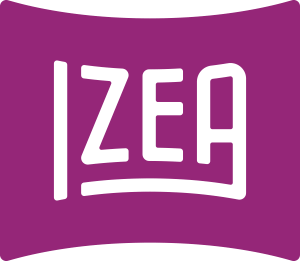 In 2006 Izea created the influencer marketing space. The goal was to pay bloggers for producing content for brands. Now, with over 3 million transactions under their belt, they offer marketers a software platform that covers every inch of content production and distribution through influencers. Content Direction – Brands can collaborate with creators using the platform tools. This helps keep content and messaging consistent. Secure Payments – Accounting headaches are eliminated. Brands can negotiate fees with two-way bidding, make direct offers and securely manage payments for campaign expenses. Content Distribution – Content can be published to all major social media platforms like Twitter, Facebook, Blogs, YouTube and many more. Klear is one of the world’s leading Influencer Marketing platforms. The platform offers marketers an a-to-z solution for their influencer campaigns, with a powerful yet simple influencer search engine, influencers profiles, campaigns analytics, and campaign reports. Klear provides an easy and user-friendly way to become influencer marketers. The platform provides the deepest available entity-level information on more than 500 million social accounts. Klear’s focus is to show marketer’s data that matters, tie it to a clear call-to-action plan, and provide users with invaluable intelligence that will give their brand a strong competitive edge. Influencer Search Engine – Klear influencer search engine offers the marketer an easy way to find influencers by a social network, location (country, state, and even city), demographics, hashtags, gender, and more. Influencer Database – The Klear database has more than 500 million social accounts on Instagram, Twitter, Youtube, Facebook, and blogs. There are over 500,000 influencers in the database. Campaign Measurement – The platform helps marketers measure campaigns, monitor brands and mentions of products and see how influencers mentioned them and what was the campaign’s performance. Mavrck was named a ‘strong performer’ as an influencer marketing solution by Forrester. This all-in-one influencer platform provides relationship management, workflow automation, and influencer measurements for brands to create a completely comprehensive program. Unlike calculating the typical impressions, engagements, and clicks, Mavrck also measures online conversions, offline sales, and brand lift. They also offer proprietary fraud detection making it much easier to calculate real engagement. Brands choose to use Mavrck to create powerful influencer marketing programs at scale. The all-in-one influencer marketing platform makes it easy for brands to discover and activate thousands of influencers, thus helping them create content across multiple touchpoints. Automated Fraud Detection – Mavrck offers proprietary fraud detection for followers and engagement, unlike many of its competitors. Activation Use Cases – Creating blogs, posts, videos, links, videos, ratings, reviews, and research surveys has never been easier for a brand. Reward Fulfillment – Brands never have to miss an influencer payment or product shipment. Mavrck increases your efficiency and manages fulfillment for you. Pixlee offers a few management tools, making it an all-in-one platform. Along with their influencer marketing solution, they offer email marketing, ads, and more. With their influencer solution, brands can build a bigger community. Pixlee gives brands an easy to use CRM that makes discovering influencers a breeze. Brands can then sort this list to see their top engaged customers. They can even look across their social profiles to see who can provide them with the highest reach. Influencer Watch List – You can identify people that are relevant to your brand and audience but have not engaged with your brand directly yet. Influencer Mangement – Nix the messy spreadsheets and manage influencers easily from one platform. Campaigns And Galleries – Publish shoppable content from social media influencers across marketing channels. Obviously is a full-service influencer marketing agency. They offer innovative marketing packages like white glove service to help you handle all aspects of your influencer marketing campaigns. Obviously helps you to build and manage your influencer network, so all you have to do is focus on developing authentic relationships and accomplishing your marketing goals and strategies. Influencer Identification – Use a database of over 400,000 influencers by age, gender, location, interests, quality, and aesthetic to build the community that is the perfect fit for you. Shipping And Logistics – Obviously’s handles packaging, shipping, and returns so you can focus on building the best relationships with your influencers. Relationship Management – Obviously knows that to give your influencers the best experience you need to be organized. Filter and sort the exact information you need. Traackr powers influencer marketing programs for brands across the globe. All needs from management to measurement are tracked with the platform. Enabling organizations to optimize and scale their influencer marketing programs. The Traackr platform allows brands to determine the ROI, establish custom workflows, and everything else needed to support ongoing influencer campaigns and relationships. Global Influencer Network – Along with their already hefty database, you can upload and manage your own influencers, to keep all your data in one place. Scoring Algorithm – Gain intelligent insights and grow your global network based on real metrics. Analyze 360 – See metrics on each and every influencer initiative, between content and platform. Grin is a software that helps you run influencer marketing programs your way. With Grin you have complete control over your influencer relationships and programs, all while tracking the exact data you need. Best of all there are zero collaboration fees! Grin offers one-click integrations, so setting up an influencer program with your existing software and processes is a breeze. Now you have a tool to easily transform your process and build you influencer efforts in one place. Easy Influencer Importer – Upload your roster of Influencers in a snap. Turn each upload into its own private profile for easy managing. Recruitment Automation – Publish landing pages for inbound applications and automate outbound recruits. Run campaigns while tracking everything in the process. Easy Product and Payments – Import products and let your influencers choose what they want, Grin can also track the delivery, collect W9’s, and manage payments. HYPR is an in-depth influencer marketing platform that houses profiles and audience demographic information for over 10 million influencers across major social channels. It is the World’s largest and smartest influencer marketplace that allows marketers to reach large audiences at scale. Marketers can target influencers based on their audience demographics such as age, location, and interests. HYPR gives access to these audience insights and is paramount to running a successful influencer marketing campaign. Effective Search and Discovery – Houses 10 million and more influencers across all the major social networks. Connect with Influencers – Many influencer profiles contain direct contact information making it easy to connect at any time. Understanding the Influencer’s Audience – Every influencer profile on the platform has detailed audience demographics. NeoReach has managed over $250 million worth of influencer marketing campaigns to date. So whether you are looking for a YouTube superstar or an Instagram micro-influencer, you’re in good company. Analyze the fans of influencers with our comprehensive audience demographics and insights, and start exploring the influencer partnerships, campaigns, and metrics of various brands. Creator and Industry Analysis – Unlock historical performance and pricing insights on social influencers. Cross-Channel Social Profile & Conversation Analysis – Access cross-channel social footprints and analyze audience demographics and psychographics. Custom Reports – Customized influencer lists and reporting available upon request. Popular Chips is an influencer marketing platform that provides brands with a wide range of influencers with a large demographic distribution of the followers. The platform offers a variety of reports helping brands improve marketing KPIs. Brands will also gain the ability to learn who is mentioning them, tagging them, and using brand hashtags. You can even access reports that allow you to maximize engagement and get the most out of your campaign. Like viewing the best times and days to post content. Audience Demographic – Detailed demographic distribution of the followers of any influencer. Performance Analysis – Reports to easily improve your Influencers Marketing KPIs. Social Listening – Find out who is using your #HashTags and who is tagging your brand. Influencer is a complete self-service solution for brand’s that have experience in running collaborations. With this platform, brands can run complete campaigns from start to finish. Influencer enables you to search and speak directly with their vetted creator community. Brands can also negotiate prices and terms with influencers as well as review creative content, and run reports on influencer content. In-Depth Data-Driven Reports – Measure the growth in engagement and audience, while finding out the location of where those engaged are from. Content Approval Process – Only approve the content you feel suits your brand best. Vetted Network – An extensive match-making search tool to find creators that best suit your brand. Lefty is a powerful technology created by a team of big data engineers and data scientists. The team is made up of individuals who come from research facilities to include ENS, Stanford, Imperial College, and Google Search. Lefty has turned billions of social data points into the world’s most intelligent influencer software. Lefty makes finding the right influencers for your brand’s objectives easy. By using smart algorithms, you can turn raw data into thorough profiles, to help you select the best content creators. Influencer Platform – End-to-end platform to manage influencers relations. Competitive Watch – Access to on-demand annual benchmarks and monthly reporting to monitor closely your efforts. Recruitment Program – Recruit dozens of relevant influencers who are willing to collaborate with your brand. Sideqik is a single hub for teams to collaborate and execute campaigns. It allows you to centralize your creator relationship management and measurement in one place. Sideqik’s platform helps brands understand the impact of social influence on their brand, their competitors, and their market. It can measure content performance, power up word-of-mouth, host campaigns, and track them all in real-time. Sideqik works with brands to power the most engaging and sophisticated marketing initiatives in the world. Identify Trends in Your Market – Insights that help you better understand your brand and industry. Measure the Impact of Creators – Understand the value of your creators and gain insight on their reach. Vet Potential Creators – Evaluate every creator at a glance and recruit dozens of relevant influencers who are willing to collaborate with your brand. Fanbyte distributes organic creatives at scale and allows you to drive conversions at scale so you can get millions of views without the hefty price tag. Targeting & Distribution – Whatever your ideal audience, you can define your targeting criteria on the Fanbytes platform. Analytics – Measure views, CPM, clicks, CPC, CTR and more. Creative – Creatives are custom built to resemble the look and feel of Snapchat and Instagram’s most popular content. BrandSnob is a self-serve marketplace that takes the hassle out of both finding and managing Instagram influencers. Post a campaign to the global community and within minutes the offers will start rolling in from influencers genuinely excited to promote your brand. Work with those you want, approve jobs and generate unbiased reviews and authentic content for your brand. BrandSnob’s marketplace connects you with micro-influencers, helping you generate authentic reviews and content. Creators With Influence – Reach more than 350 million Instagram subscribers in the world. Invite Influencers – Browse profiles and invite influencers you want to work with. Authentic Advocacy -Get unbiased reviews and more authentic content. Tidal Labs is a platform for building and managing influencer relationships across the globe. It uses a proprietary influencer platform that combines the tools needed for a business to build a private network of influencers. The platform allows brands to manage their relationships, communication, and incentives. Now brands can gather info, distribute products, issue payments, without all the hard work. Track & Optimize – Report ROI across campaigns, teams, brands & regions. Customize & Integrate – Bring your influencer programs into all of your enterprise. A full CMS built for social – Review, edit, rate & distribute all your influencer content in one place. With Influencer DB, you can create and manage all of your influencer marketing campaigns. The platform allows brands not only find but also analyze influencers to match their exact audience. The platform was built for teams and allows for easy organization and monitoring of both your competitors and what your influencers are doing. Global Influencers – Search and discover influencers in a global database. Easy Analytics – Analyze influencers and their audiences and even review competitor mentions. Fraud Stopper – Catch fraudulent influencers along with fake engagement. Captiv8 connects brands to digital influencers and creators to further reach Millenials. The core of the platform is held together by social listening, insights, and self-serve platform. As a brand, you can also predict engagement from influencers for every campaign. Then sit back and monitor in real-time and optimize as you go. Deep Demo Data – Learn more about your audience by also analyzing HHI, religion, language and top interests. Competitive Benchmarking – Track their growth by geography and benchmark your content performance. Trending Content – Know what posts are trending and learn what your fans want to see. Webfluential is an influencer marketing platform that hosts influencers and helps rising social media celebrities with their influencer marketing campaigns. The platform focuses on Facebook, Twitter, Instagram, Youtube, and even websites built with WordPress. Webfluential helps thousands of types of customers – from e-commerce shops to big brand names – helping them craft stories and share them with their audience. Collaborate With Influencers – See the content that matters most to your audience and drive the conversation. Manage Progress – See how your message was received and which influencers resonate best with an audience. Free Trial – Start a free 7-day trial. Social Circle provides an easy and cost-efficient way to convert social influence into real revenue and powerful data. The platform features a value calculator to measure engagement levels, helping brands from overpaying. The platform is free to use and offers a large database of influencers as well as micro-influencers. Deep Search – Find up-and-coming micro-influencers to household social stars. Backed Engagement Calculator – determine which influencers will deliver the most engagement for your budget. Managed Service – If you want the hands-off approach, Social Circle also offers managed services. Tagger Media is a time saver when it comes to streamlining influencer campaigns. The platform helps from the very start of discovery, planning, activation, and reporting. Now your team can stop the guesswork and start building influencer relationships that will take you to the top. This platform offers an over 1 million influencer database and an opt-in marketplace. With plenty of insights and behavior tracking tools, you can find the perfect fit for any of your influencer jobs. Review Relevant Audiences – In-depth audience insights that resonate with your social audience. Search Filters – Make it easier on yourself by using quick search filters to find the best match. Two-Way Messaging – Send emails to any Creator via Tagger or their email address. Openinfluence is for everyone from small companies to large agencies who want a place in the influencer marketing world. The platform supports brands across a variety of social media platforms. Openinfluence also allows for rate negotiation and even payment processing. Management Tools – Manage everything from influencers, contracts, scheduling, and client dashboards. Advanced Search – Search by demographics, topics, interests, keywords, and image recognition labels. Content Analytics – Analyze each piece of content, and see each aspect drives performance. The Cirqle is an online marketing and creative department. The kicker is that it comes with free and unlimited creative resources, along with access to top creators. On top of that brands also receive a sales attribution infrastructure. The platform uses an estimated impressions number to put in perspective the potential reach an influencer has. The Cirqle provides the exact tools you need to track content performance. Library Of Tools – An all-in-one platform gives you everything you need to run your business. Free Expert Insights – Experts share strategies from past clients to bring you success. Full Support – Chat about all the ins on influencer marketing strategies 24/7. Takumi does all the heavy lifting for the entirety of all campaigns. Everything from influencer vetting to payments to post-campaign analysis. The advanced managed service platform combines with a team of Takumi experts to create unmatched campaigns. This ensures the best quality campaign experience for brands. The high-quality standards upheld by community manager results in great engagement rates and quality content. Quality Influencers – A strict vetting criterion is put in place to ensure only the highest quality talent are in the mix. Campaign Strategy & Setup – In-house experts help you create a complete influencer strategy to help you achieve your objectives. Brand Safety – The Takumi Admin tool gives you access to a live campaign report. Matchmade is an easy-to-use influencer platform that helps brands create targeted and measured campaigns. You only pay for performance, meaning you pay for actualized campaigns only and there are no monthly fees. Matchmade is geared towards game developers and their algorithm matches your game with the best and most relevant influencers in the market. Logistic Bliss – No monthly fees and we handle all influencer payments for you. Full Service – A fully managed custom solution if a self-service platform isn’t your thing. Negotiate With Ease – The team can recommend prices based on channel data but ultimately it’s up to you. Julius allows brands to discover influencers with just a few keystrokes and over 50 search filters. Finding an influencer for your target audience has never been easier. The platform offers in-depth campaign management and messaging to better help get your brand’s message and voice across. The in-house research team makes decision making a breeze, and following influencers is simple with the built-in CRM. Quick Campaign Launch – Launching is easy when you can easily organize communications, track deliverables, and manage payments. Exportable And Customizable Data – Make presentations and run an analysis with fully customizable data exports. Reporting Metrics – Whether it’s cost per engagement, engagement rate, or earned media value, you have all the data at your disposal to evaluate your campaign. Brandnew’s software makes it easy for you to discover influencers across social media channels. The platform offers influencer on-boarding, campaign building, and tracking data sources. Track all data sources in one platform and discover the total impact of your influencer marketing. Brandnew has an expert team of influencer aficionados to do all the heavy lifting for you. Detailed Demographics – Discover new creators based on their audience. Now you can spend your media budget for the right audiences. Direct Messaging – Communication is in one place for you and your teams. Collaboration Tracking – Measure the reach, traffic, engagement, and ROI. Peg is an influencer marketing platform that offers brands an in-depth feature to find influencers. It also offers a brand safety checker to ease your mind. The platform is used by over 1,700 companies across 169 countries. Identify Perfect Partners – Effortlessly identify the right influencers for your brand. Measure What Matters – Tracking and post-campaign analytic tools to measure what has worked for you. Become An Influencer Guru – Execute influencer marketing campaigns that deliver real returns. Scrunch lets you reach your ideal consumer by using data-driven insights and a built to work platform that makes influencer marketing a snap. This platform connects brands and agencies to bloggers and influencers, like a match made in heaven. With one of the largest databases in the industry, finding the perfect influencer fit is achievable. 20+ Millon Influencer Profiles – A large database for finding the perfect fit. Flexible Campaign Management – Pick the right level of help from our legendary team of campaign managers. Powerful Audience Analysis – Understand what makes your audience buy. Shopping Links provides the perfect platform to help brands track creator’s media in one space. The platform aims at pairing the perfect influencers for each brand. By assessing each influencer’s audience and measuring their authenticity, brands can have a campaign that leads to increased ROI. Influencer Analytics – Access social and website following, engagement, audience demographics. Content Gallery – Access, download, store and search influencer images created for your brand. Campaign Analytics and Tracking – Track individual performance along with conversion metrics for both web and social campaigns. Dovetale offers multiple features for social media marketing. Including monitoring of competitors growth, finding creators, and other aspects of influencer campaign management. The platform allows for easy monitoring of account growth, engagements and helps to uncover detailed audience data. Account Details – Monitor account growth, engagements and find audience data. Watch Competitors – Keep an eye on the competition by comparing social data. Find Trends & Insights – Visualize social growth. indaHash works with micro-influencers who have anywhere from 10,000 to 100,000 followers. Meaning the message is more personalized than and honed into your target market than with a regular influencer campaign. The platform focuses on three different space, Instagram, Facebook and Twitter. The platform operates all over the world and in 80 markets, meaning brands have a great chance of exposure. User-Generated Content – Content is made by digital influencers themselves. Regram / Repost – There is also the option for digital influencers publish the same photo provided by the brand. Credibility And Engagement – Content is published on the Influencers` own profile and therefore are not perceived as an advert. Socialix is an influencer marketing platform that will help your programs and help you improve performance with its end-to-end solution. The platform connects influencers and bloggers with brands and talent agencies. The whole process is done in 4 simple steps. Starting with media kit creation, then the partnership with advertisers, followed by content creation, and finally receiving payments. Automated Workflow – Streamline your entire collaboration process in an automated workflow. Custom Integrations – Connect Socialix to your existing technologies and centralize your data. Influencer CRM – Organize your influencer community and track all communication. Influencer marketing programs use the power and influence of highly followed individuals. Unlike referral marketing, this type of marketing is for larger groups of people and is a less individualized and personalized action. Though the influencer gets to add their own spin on the content used to drive followers to a specific brand, they are not seeking out specific individuals. Do you know of any other influencer marketing platforms? Or have you ever been a participant in an influencer program? We’d love to hear about it.